One of my favorite aspects of my passion for detailing is testing new products regularly. I routinely preach technique and practice over leaning on a product to achieve the results you are looking for (see the bottom of article for some of my favorite blog posts to improve technique). Once you are proficient though, who wouldn’t want to find the perfect line of products to produce the same or better results in less time? In the last several months P&S Bead Maker was widely reviewed in the detailing community. There has been a lot of buzz and I was anxious to get my hands on some. We have been using it regularly in our shop for the past several months so let’s get right into how it has been performing for us! 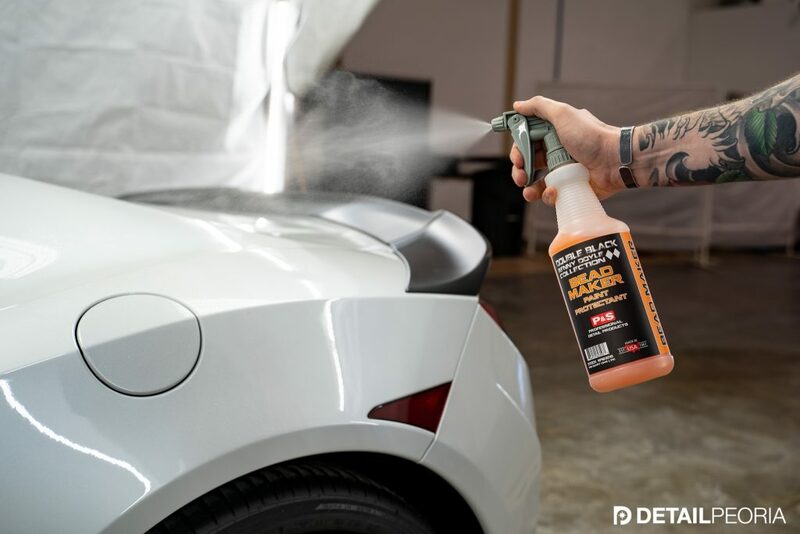 First things first, Bead Maker is a spray-able polymer sealant that can be used to top coat on waxed, sealed, or ceramic coated vehicles. It can also be used as a stand-alone protectant and as a drying aid. It performs its best when applied to a dry, freshly detailed, vehicle. When the panel is perfectly clean and dry, spray a fine mist of product to the panel and also to the first towel then begin to level and remove the product. If you are using Bead Maker as a standalone protectant, the first application should be more liberal and you will want to work the product in a little longer to ensure a solid base layer of product. I prefer to keep a second and third dry microfiber towel handy for removing the excess residue. Click here for my favorite LSP Towels. The product will cure during the next 8 hours, during which time you should not get the vehicle wet. When fully cured the gloss levels and slickness will be enhanced from initial application. Over the course of the last several months using this product one thing is for certain, this is by far, the easiest to use last step product we have ever tested, bar none. It is that simple. When you level this product, it is simply effortless to perform the final wipe down and watch the remaining product flash to a brilliant, streak-less finish. This is far and away our favorite characteristic of the product. You can work your way around the car quickly and with confidence you are not leaving streaks or residue that will cure to an unsightly blemish. 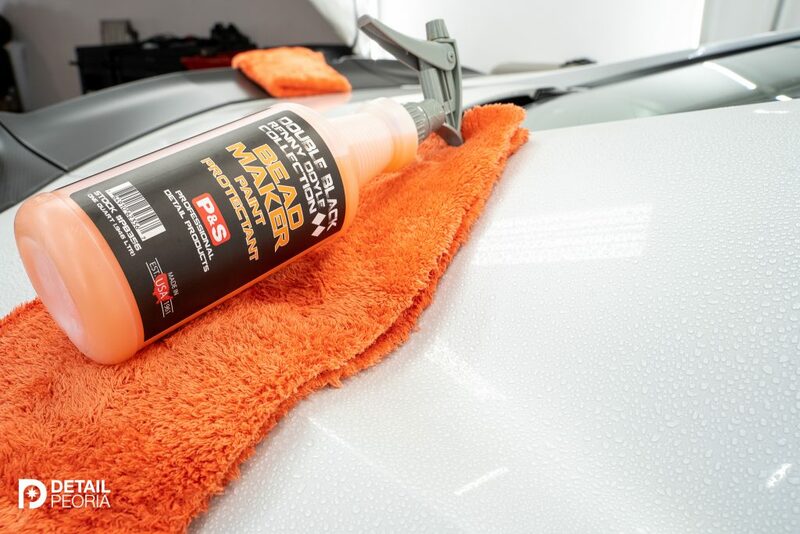 This is the major advantage this product holds over our favorite ceramic based top coats. With those products, they don’t buff away as easily, some are plain difficult and streaky, then if you miss product and don’t catch it in time, it may require a little more work than simply wiping it back up. Bead Maker flashes away so effortlessly we were simply floored. We can get around a car in 5-10 minutes easily adding a huge efficiency gain to our shop. We all like products that are easy to use but how is the performance. Easy, the best slickness and gloss of any spray sealant we have ever used. It is a very satisfying application process as it begins to flash you start to feel the microfiber slide effortlessly and wipe across to reveal excellent gloss. Just wait for it to cure and you will see the full effect. Get the panel wet for the first time and you will experience very satisfying water behavior. Nice tight beads and great water shedding ability, it lives up to its name! On top of our own ceramic coated vehicles, we were seeing the product produce the same water behavior for several months. Is it going to last as long as some other spray on protectants on the market? My expectation in real world, daily driven, applications is no. However, in my mind, the ease of use means reapplication is not much of an event and can easily be added to the regular detailing routine. So, I know many of you are asking yourselves, ‘Is he going to answer the real question here?’ and the answer is yes, of course. What does Bead Maker smell like? Well I am happy to report, Bead Maker has a nice subtle peach scent. Not the best smelling product on my list (No really, I have a list, new blog post in the works) but definitely not the worst (cough, Iron-X cough cough). Bead Maker adds a cherry on top with a very affordable price point. I am excited to add this to our go-to line-up and very happy Detailed Image has chosen to carry this and more of the P&S line. As for the title question, is Bead Maker the best last step product ever? Well, of course, this will change given desired results and each given situation. My take is this, Bead Maker is an extremely easy to use, multi-month polymer sealant, with striking slickness and gloss. There are many other products out there I like very much that have some of these characteristics and some that last longer but at the end of the day, I find myself reaching for Bead Maker more often than not. Best last step product is a hefty title to defend, but I will plant my flag on the fact that Bead Maker is the best last step product for most people. 19 comments on P&S Bead Maker Review: Best Last Step Product Ever? Great article, thanks for sharing! There are lots of great products in this area but I share your sentiment, this product is very compelling! I actually enjoy CarPro Elixir over Beadmaker call me crazy! For me it’s the simplest topper although I know it’s technically not a sealent but it does give good slickness and insane gloss!! I haven’t tried Elixer yet, thanks for your input! I have to wonder if it flashes and spreads so easily because it’s short on ceramic/si02? Have you tried pinnacle si02 spray? Very impressive, I wonder if its just new technology in all these new sio2 sprays. It seems like everyone has one now. Beadmaker is not SIO2 based. It is technically a sealant. So it might be a deal breaker if you want a ceramic based spray for your coatings. This could get into a deeper discussion that is probably a good topic for another article. My observations: Bead Maker is by far the slickest feeling product I have ever used. No really it is that slick. However, gloss properties? Well I have seen zero difference comparing panel to panel. For me it did nothing for gloss levels. What I had initially wanted was an extremely easy wipe on wipe off product that left no streaking and could be applied to ALL surfaces of a vehicle. Would be nice to send off a customer vehicle with all glass done with this and would last them several months of water sheeting off. Application was as described above that easy and left the finish wonderfully slick. Now onto the biggest issue: I applied this product to my RRS that was fully coated with 22ple Mistico Elemento coating. I applied Bead Maker to all surfaces including black trim and glass. Then took a 500mi trip that did have 300mi or so of rain. The next day washed the vehicle and WOW there was no beading left on the glass surfaces. Basically the Bead Maker wore off all the glass surfaces, not just the windshield. So waste of time and money for me. To be fair, all of the advertisements and directions do say this product should be applied regularly and with each wash. Large application for the first time, then supplemental from there on out. If that were done, I am sure the product would have some longevity. But, for me to apply once to a customer car or to my own vehicle its a waste to me. For about $35 a gallon with towels on Amazon, its worth a try for anyone and see if you like it for yourself. Just sharing my experience. Was very very very disappointed. I have not used Beadmaker on anything but paint. I understand the convenience of a single product to rule them all but it would come with many compromises on different surfaces. Fully coating glass with Gtechniq G1 is nearly effortless though there is some time delay but you can go do something else while it sets up. I think there is still a major benefit to specialized products for paint, glass, trim, and leather. I have been using bead maker since it’s debut and unless the customer pays for my 6 month protection upgrade (Jescar Powerlock +) or a ceramic coating it is the only LSP I use. 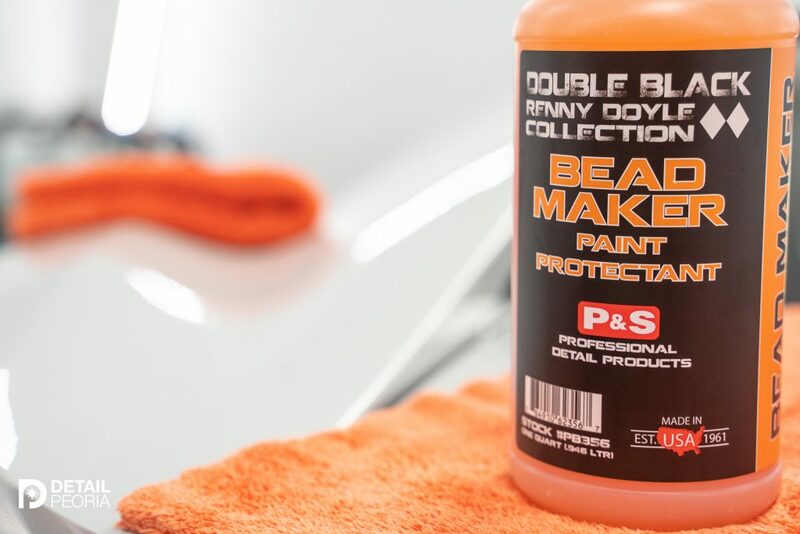 The price point, ease of use, quick application, slickness and gloss it provides makes it a no brainer for any pro detailer, Mobile or fixed. I’m interested to see what products make your list for best smell. I’ll keep an eye out for that article! We use it the exact same way! I am weird about the smell of my products, stay tuned for that post! I agree that it’s a great product but for me it’s not a final LSP but rather as a drying aid. Love it for that. 2 of 3 of my vehicles are wearing GYEON’s Syncro and will likely always wear a coating of some type and even there, BM works well as a drying aid that adds slickness but without seemingly changing water/hydrophobic behavior. The third vehicle is wearing PNS as the LSP and there too BM works great as a drying aid/detail spray when I’m done with cleaning it up. Love it as a drying aid, Stay Glossy! I think you are right, there are many products that compete at very similar levels in terms of strictly gloss. Great article. Quick question – Would Bead Maker be a decent replacement for CarPro Reload for topping a fresh application of CQuartz? I love it for topping my coating. I feel like it adds boost to the characteristics of the coating. The coating I have is known for its slickness and gloss too. Bead Maker plays well with coatings and other forms of protection. It comes at a great price point, I would say try it out and see how you like it in your situation. It is a polymer sealant that is layered on top of whatever protection you already have or bare paint. It is not like some of the other coating toppers which have a silica component to them. Thanks for the reply. 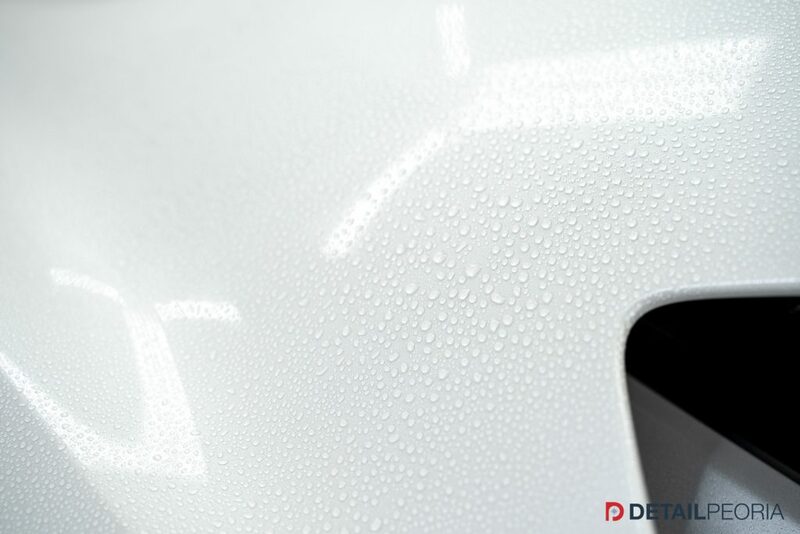 Will Bead Maker prevent the water spots that are typical for car coated with CQuartz (and other coatings)? Reload seemed to do a good job, but looking to try something different after I coat my BMW X2. Thanks again. Dude Iron and fallout removers are the worst! Fart spray that happens to clean your wheels haha but great article man! I’ve been curious about trying bead maker for a while now and you definitely helped add it to my cart. I look forward to seeing more articles from you!